Home » Politics » Sanjay Raut praises Rahul Gandhi: What explains Shiv Sena’s sudden love for him? Sanjay Raut praises Rahul Gandhi: What explains Shiv Sena’s sudden love for him? Shiv Sena’s Sanjay Raut praises Rahul Gandhi in the presence of several BJP leaders. What’s cooking? The Shiv Sena appears to be continuing with its policy of taking regular potshots at its alliance partner Bharatiya Janata Party. And yet again the man firing the salvoes is Sanjay Raut Rajya Sabha MP and editor of Sena’s mouthpiece Saamna. Raut praised Congress vice-president Rahul Gandhi and said that political opponents should stop calling him Pappu because he is attracting huge crowds and can be a strong contender for the post of Prime Minister in future. Interestingly, Raut chose to make the statement in the presence of several BJP leaders – education minister Vinod Tawde was sitting right next to him. As expected, the statement sparked a political controversy in Maharashtra. In a later session in the same conclave, Chief Minister Devendra Fadnavis responded to Raut and dared the Shiv Sena to walk out of the government. Raut didn’t just praise Rahul Gandhi he also said that the anger over the tardy implementation of the Goods and Services Tax (GST) would prove costly for the BJP in Gujarat. “The anger brewing among people of Gujarat over GST will reflect in the state Assembly polls scheduled in December this year…no political party should undermine the power of voters. They can show anyone his or her place. Shiv Sena is the oldest partner of the BJP but the relationship started to turn sour after the 2014 Lok Sabha elections and part of the reason for this is the Sena’s fraught relationship with Narendra Modi. The late Bal Thackeray is known to have had reservations about Modi. Also, it must be remembered that Sena did not favour Narendra Modi as the NDA’s PM candidate. The bitterness increased during Maharashtra Assembly elections, in which the two parties fought separately and the alliance was on verge of breaking during Municipal Corporation of Greater Mumbai (MCGM) elections. Shiv Sena executive president Uddhav Thackeray has even gone to the extent of announcing that his party will never form an alliance with any party in future. Despite being in power with BJP at Centre and the state, Shiv Sena continued to attack its ally over several issues. Raut, in his articles and editorials in Saamna, would lambast BJP almost every day. While Raut praised Rahul Gandhi, in the same breath, he predicted that the Modi wave which led the BJP to such a massive victory in 2014, has been dissipated. While Raut’s statement has created a buzz in the corridors of power, analysts have dismissed it saying that it won’t lead to any change in Maharashtra’s political equations. "Shiv Sena has been criticising BJP, despite sharing power. The latest statement by Raut only hints that BJP should stop taking Shiv Sena for granted. 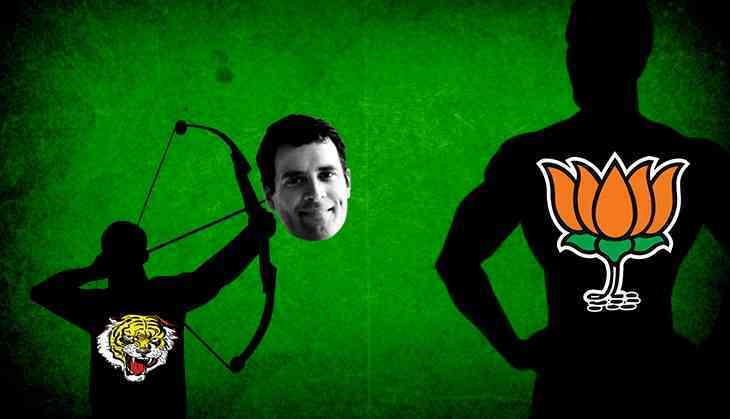 There is no possibility of a Shiv Sena-Congress alliance. The sole objective of making the statement was to poke BJP leaders and ministers present at the conclave," said veteran journalist and political analyst Kumar Ketkar. Ketkar said that Shiv Sena, Congress and Nationalist Congress Party (NCP) were in talks regarding an alliance late last year and had almost reached a consensus. According to Ketkar, the leaders had agreed on the arrangement that Shiv Sena will form the government, with Uddhav Thackeray as chief minister and the other two will support it. But it couldn't work out as NCP proposed that Shiv Sena and Congress would form government with its support from outside. "This proposal didn't go down well with Shiv Sena and Congress and the possibilities of alliance ended there. Now there is no such possibility," Ketkar said, adding that, "The bonhomie between NCP and BJP was evident during felicitation of senior NCP leader Dilip Walse Patil in Mumbai on Friday. The who's who from BJP were present but no one from Shiv Sena was attended the function." Senior journalist and political analyst Abhay Deshpande echoed Ketkar. "There is no political weight to the statement. It is merely an attempt to irritate BJP leaders. After making the statement in the conclave, Raut took a U-turn the next day. When asked would Shiv Sena join hands with other political parties in Gujarat, he did not think even for a second to say, they will not come in the way if BJP is winning the election. This shows that Shiv Sena leader himself is not serious about even his own statement," Deshpande said. TWEET THIS Stop calling Rahul Gandhi ‘Pappu’. He can be a strong PM contender: Sanjay Raut, Shiv Sena Shiv Sena’s Sanjay Raut praises Rahul Gandhi in the presence of several BJP leaders. What’s cooking?